Jerry Seinfeld has turned up in an integrated advertising campaign for Greater Building Society, an organisation based in Newcastle in the Australian state of New South Wales. The comedian agreed to appearing in television, radio, print and web advertisements for the organisation after their marketers pitched their concept to his manager George Shapiro. Greater marketing head John Dwyer worked with creative director Paul Wilson Loud, Sydney, to develop the Seinfeld campaign. Loud helped ING work with Billy Connolly in their Australian advertising campaign. Dwyer said they had a shortlist of possible celebrity spokesmen but Seinfeld was at the top because his clean-cut yet cheeky style matched the brand. Filming of the Seinfeld shots was shot in Cedarhurst, Long Island, near Seinfeld’s home, by director Christian Charles via Mouse Roar with producer Bob Fisher and production designer Pete Zumba. 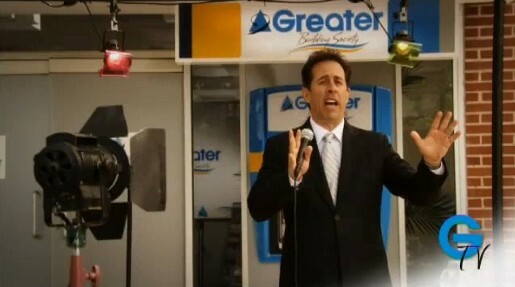 Charles also worked with Seinfeld on the American Express campaign. Post production was by editor/VFX supervisor Joe Morris, editor John Holt, assistant editor Jessica Mutascio, colourist Scott Maclean, Flame artist Scott Geersen and post producer Sarah Brown. This is Seinfeld’s third advertising campaign, following on from his work for American Express (with Superman) and Microsoft (Shoe Circus and New Family). He also appeared in one of Apple’s Think Different advertisements.